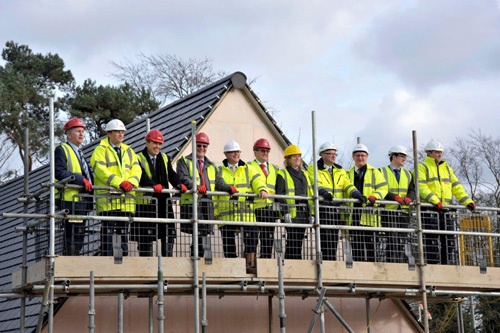 Carrowbeck Meadow, the first development of 14 highly energy efficient houses in Hellesdon from Broadland Growth Ltd, had a topping out ceremony to mark the start of the selling process from William H Brown. Broadland Growth is a commercial company set up by Broadland District Council and the NPS Group, (launched 6/2/2016) to focus on small, high quality developments with excellent energy efficiency. This highlights the start of the company beginning to play a part in the needed growth in the district. The company was set up to generate income to support council services for Broadland District Council and NPS are utilising their Passivhaus expertise to raise the bar in providing sustainable homes in Norfolk. The Carrowbeck Meadow site is on land owned by Broadland District Council and adjacent to its Carrowbreck Training centre on Drayton Road. The Broadland area is continuing to evolve and has already been identified as an area for growth with more plans in place. As infrastructure continues to develop in the area, like the recent start of works on the NDR, the requirement for houses must also be met and Carrowbeck Meadow is the start of Broadland Growth contributing to solutions. The development consists of two three bedroom, and six four bedroom detached houses which will be sold on the open market. Another four two bedroom, and two three bedroom semi-detached houses will be offered on a shared equity basis with priority given to people with connections to the Broadland District. All houses will meet Passivhaus standards – an international benchmark for excellence in energy efficient construction and will provide a high level of occupant comfort while using very little energy for heating and cooling. From today, potential buyers are being urged to register their interest and apply for a brochure to be among the first to visit the show home when it opens in early May. This can be done by contacting William H Brown, the sales agent for the development on: 01603 760044. Anyone interested in the shared equity properties must also register with Help to Buy agents on : 03333 214044, email:helptobuyeastandsoutheast@bpha.org.uk. Chairman of Broadland Growth Limited and Broadland District Council Leader, Andrew Proctor, who took part in the event, said: “Achieving environmental excellence in everything we do is one of our key ambitions and I’m proud of this development. The homes will meet exceptionally high standards of energy efficiency making them much cheaper to run than the average house as well as good for the environment. Passivhaus projects are among the lowest energy buildings in the UK. All 14 properties in the development will be Passivhaus certified. To achieve certification in the UK, all Passivhaus buildings have triple glazed windows and doors, high levels of thermal insulation, draft free construction, thermal bridge-free construction, and mechanical ventilation which provide fresh air and heat recovery – making these very healthy buildings to live in. All of the homes have been positioned to maximise access to solar gain in winter and prevent over heating in summer.